You can modify the registry in your package by choosing the Registry tab in the project dashboard. You can create a new subkey or add an existing subkey under any key, including root keys (or hives). However, you cannot create new root keys. In the Registry tab, open the context (right-click) menu for the root or subkey where you want to add a subkey and then choose Add Key. In the Add Registry Key dialog box, create a new key by entering a new name or using an existing key to create a new key. Add all subkeys under the existing key. Clear this choice if you only want to add the selected key. Add the values of the keys. Clear this choice to add only the key. Adds the complete path from the top level of the new key to save you from having to manually re-create the entire path, starting with the top level. In the Registry tab, open the context (right-click) menu for the root or subkey for which you want to change the name, and then choose Rename. Change the name of the key and press Enter. In the Registry tab, open the context (right-click) menu for the root or subkey for which you want to change the name, and then choose Disposition. Choose Apply setting to subkeys recursively to apply the same disposition to the subkeys. In the Registry tab, open the context (right-click) menu for the root or subkey for which you want to change the value, and then choose Add Value. For Name, enter the name of the registry value. For Type, select the data type of the value. For Data, enter the registry value. Choose Display as hexadecimal to display the hexadecimal value. 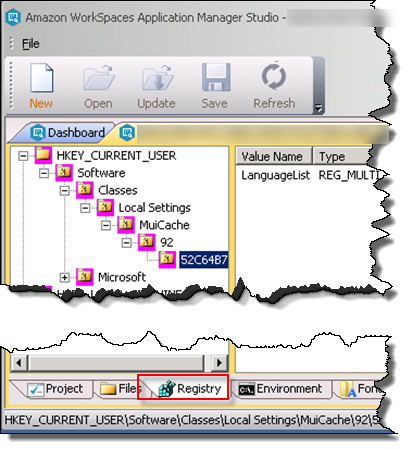 If the registry value appears to contain an environment variable, such as %ServerName%, Amazon Studio attempts to resolve the environment variable. If the environment variable does not exist, then Amazon Studio escapes the % characters. %ServerName% becomes %%ServerName%%. To use an environment variable as the value, define the environment variable in the Environment tab. In the Registry tab, open the context (right-click) menu for the root or subkey for which you want to change the value, and then choose Edit Value. In the Edit Registry Value dialog box, make your changes. In the Registry tab, open the context (right-click) menu for the root or subkey for which you want to change the value, and then choose Delete. Registry keys that are excluded in a package are not used in Amazon WorkSpaces, but are still part of the package. This gives you the flexibility of including specific keys one package deployment and not for another package. Excluding keys also enables you to test an package without a key before removing the key from the project. In the Registry tab, open the context (right-click) menu for the root or subkey that you want to exclude, and then choose Exclude. Excluded keys appear in italicized text.